Hey folks… It’s been 2 1/2 years since I started working on the second Daily Thumbprint Collection record and the project is getting close. We’re looking at an album with about 20-25 musicians from across the country on it… including some of my good friends from Los Angeles to San Francisco, Reno, Nashville, and New York. I look forward to being able to share some music with everyone soon. Dan’s trumpet mute belt was really the highlight of the show. Daily Thumbprint Collection is released! My first solo-album is finally out. You can find it on iTunes, emusic, napster, aimestreet, etc… It’s taken me 5 years to get this damn thing out, and I would really appreciate some listens, comments, and purchases. Don’t try to buy one from me in person… chances are I’ll just give you one… but you can pick them up without my awareness at cdbaby.com or at live shows (I have them for sale at most shows). The project is named “Daily Thumbprint Collection” and is entirely a solo-creation (except for appreciated contributions from Sam Minaie and Gavin Templeton on the first track). I wrote it, performed it, recorded it, mixed it, mastered it, and did the artwork and package design. I’m damn proud of it too, so please check it out! Daily Thumbprint Collection is a solo album by drummer Caleb Dolister. The album consists of several songs that have been worked, reworked, and then reworked again – some taking as long as 5 years. 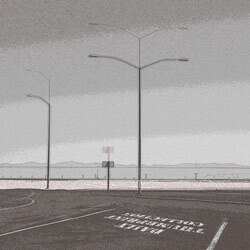 The initial sound is similar to that of a Downtempo, NuJazz, or Instrumental Indi-Rock album. It seems to be electronic-sounding, containing many ambient background sounds and fluid melodic synth-bass lines. But very quickly, the music starts becoming too unpredictable to be just another mix or loop based album… Many albums in the semi-electronic genre consist of live instruments played with sampled drum samples or loops. This album is the opposite: live drums. Approaching the album in this way seems to have given Caleb Dolister’s solo project a unique sense of life. It’s not just an electronic solo album – the life in the rhythms give it the energy of a rock album. For the listener – it presents itself very much like a personal soundtrack, but will surprise you with ferocious percussive energy and performance throughout.